Natural mosquito repellent spray made with essential oils (lemon, camphor, geranium,eucalyptus and pine) DEET-FREE, non-toxic for the environment, hypo-allergenic and safe for the whole family! 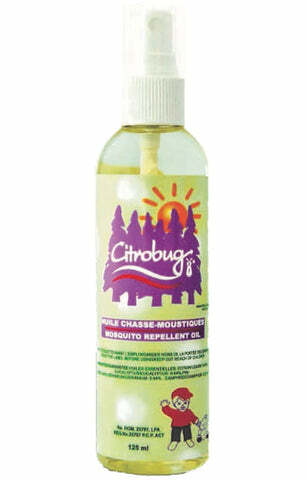 Most effective product available on the Canadian market to date, Citrobug has been shown to be as effective as any other product that contains 25% DEET! Our product may be used safely. Citrobug is recommended by health professionals because of its non-toxic properties in comparison with others containing DEET, paraben or other dangerous chemicals. Ideal for kids 2 years old and over. Mineral oil extracted by a certified Ecocert process. Vegetable sunflower oil and essential oils of lemon. Geranium, pine, eucalyptus, camphor and citronella.